The STH 100 project is notable because of the stakeholder, real estate, utility and traffic complexities of an urban corridor, a railroad tunnel extension, the first large scale deployment of an Integrated Corridor Management (ICM) System in the State’s history, a 17 month project development timeframe made necessary by the Zoo Interchange Mega project program, a low bid within 1 percent of the engineers estimate and a completion on time and within 2 percent of the let amount. Aaron Bubb of Kapur was responsible for the design of STH 100 / Mayfair Road from environmental phase through final design. Working as part of a Joint Venture, Kapur & Associates provided project management for the environmental impact statement, public involvement, agency coordination, utility coordination, traffic analysis, alternative evaluation, community sensitive design, survey, right of way platting, preliminary and final roadway and structure design, traffic signal design and integrated corridor design. The project design incorporated several unique aspects including the use of 11 foot lanes to reduce right of way cost and impacts, 5 foot bike lanes per TRANS 75, the extension of the Union Pacific Railroad tunnel beneath the major intersection at Bluemound Road, a stream relocation at the Milwaukee County Research Park, adaptive signal technology, streetscaping, way-finding and landscaping. A two way multi-use trail was a last minute Zoo Interchange program addition to the plans after PSE. The multiuse trail was incorporated into the design between Bluemound Road and the Hank Aaron State trail to provide a connection from the trail to the Milwaukee County Zoo. 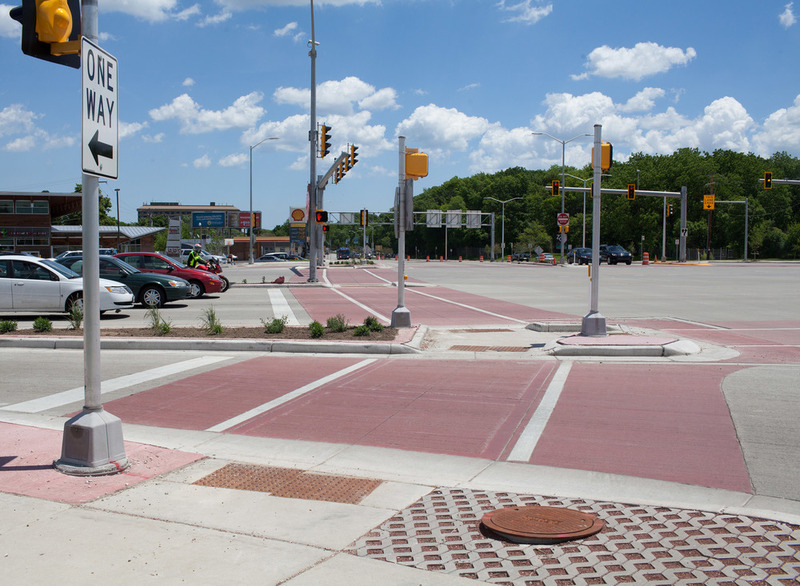 Kapur & Associates staff performed Project Management of Watertown Plank Road reconstruction as well as the Watertown Plank Road Interchange, including portions of the North Leg, North Leg Core, and Wisconsin Avenue as part of the Zoo Interchange Project in Milwaukee, Wisconsin. This portion of the project is notable because it was fast-tracked as the second portion of the interstate to be reconstructed. With complex stakeholder, real estate, utility, and traffic issues found within this part of the corridor, the success of this project was paramount to the future staging and construction operations of the Zoo Interchange project. The completion of the Watertown Plank Road interchange, along with the local arterial improvements on Watertown Plank Road, Bluemound Road and STH 100 Mayfair road will carry the weight of traffic seeking bypass of the construction yet to come on the Zoo Interchange. Tim Flynn of Kapur was responsible for the design and management of the Watertown Plank Road Interchange ramps and adjacent section of USH 45 from environmental phase through final design. Tim was also responsible for conceptual and preliminary design of the entire North Leg of the Zoo Interchange. Working as part of a Joint Venture with HNTB , Kapur & Associates provided project management for the environmental impact statement, public involvement, agency coordination, utility coordination, traffic analysis, alternative evaluation, community sensitive design, survey, right of way platting, preliminary and final roadway and structure design, traffic signal design and integrated corridor design. Watertown Plank Road runs east-west and consists of 2 through lanes and one auxiliary / turn lane in each direction. Bike and pedestrian accommodations are provided throughout the full length of Watertown Plank Road. Full free flow access is provided to Watertown Plank Road from USH 45 from several series of loop and flyover ramps. Six 45W” Prestressed Girder structures, two Steel Dual Girder Structures, seven MSE Retaining walls with CSD measures and four Box culverts were constructed with this project.